← Today is an 8 day in a 8 month – a Power Day – Use your Superpowers! Midweek Tarot Reading – Blessed are the curious, for they shall have adventures. For the next few days the Moon is in Scorpio! With the Leo Sun and the Scorpio Moon, things can feel a bit intense. If we can check the egos at the door & we’ll be fine! With the Mercury/Pluto trine on Wednesday, we can look deep below the surfaces for the messages and listen to our intuition which can distract Leo and Scorpio from bumping heads and instead, lend a hand. Scorpio is the detective extraordinaire and can be quite curious and Leo likes to lead the way and can take a serious mood, put it into perspective and make it lighter! Midweek the Knight of Wands rides out! (From the Victorian Romantic Tarot by Baba Studio, http://baba-store.com/ ) Traditionally we see a Knight riding with speed on his horse. This Knight has dismounted, his horse grazing while he is chatting with a lady who has collected yellow roses, resting in her gown. His energy represents optimism and charisma on his quest. His astrological correspondence is Leo with a bit of Cancer, he has a heart of gold and loves to be on the stage of life. He can be a bit over enthusiactic and his energy can burn out but in this particular card I am seeing a more consistent and measured approach. The yellow roses in the language of flowers symbolizes joy and friendship. Midweek like the lady we are gathering the things that give us joy, those friendships and those things that sweeten the journey. We might think of what else do we need to do. The Knight can be someone that comes in to play a role for us during this time and can lend a hand like the Universe’s Knight in shining armor attending to things that need immediate action. It may be a physical person that can be quite charming or some events that seem to just fall into place. We are ready to continue on our adventure with confidence open for help and friendship. So this can prove to be a very interesting week! 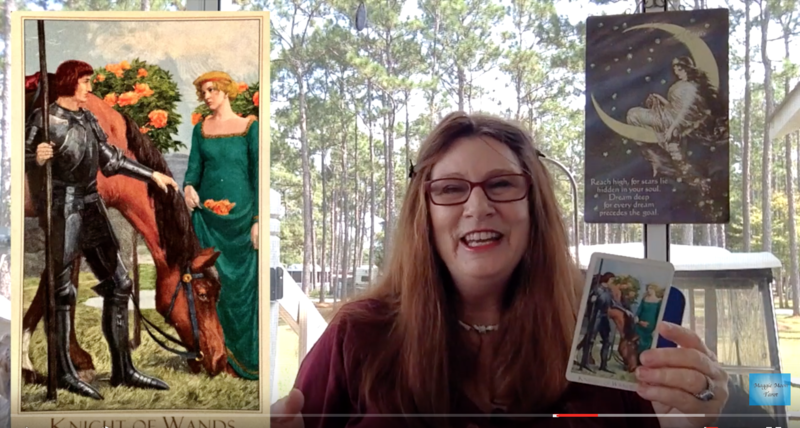 This entry was posted in Astrology, Maggie Lukowski, Maggie Moon Tarot, Midweek Tarot Reading, Moon, Tarot, Tarot Reading, Uncategorized, www.youtube.com/user/maggiemoontarot/videos and tagged Adventure, astrology, Blessed are the curious, https://youtu.be/93PySlHplKc, Knight, Life Coach, Maggie Lukowski, Maggie Moon Tarot, Midweek Tarot Reading, Moon, Quest, Tarot, Tarot Reader, The Victorial Romantic Tarot, Transformational and Manifestation Life Coach, www.youtube.com/user/maggiemoontarot/videos, Yellow Roses. Bookmark the permalink.